Despite the meaninglessness of the Discoveroids’ list, they seem to have impressed some people. We learned about it thanks to the Drool-o-tron™, which alerted us with its sirens and flashing lights. The blinking letters of its wall display said WorldNetDaily (WND). We’ve described WND as a flamingly creationist, absolutely execrable, moronic, and incurably crazed journalistic organ that believes in and enthusiastically promotes every conspiracy theory that ever existed. 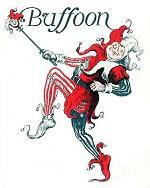 WND was an early winner of the Curmudgeon’s Buffoon Award, thus the jolly logo displayed above this post. More than 1,000 highly influential [Hee hee!] scientists from around the world have gone on record with their doubts about Charles Darwin’s theory of evolution. They hail from institutions such as Harvard, Johns Hopkins, Columbia, Tulane, Rice and Baylor, the National Academy of Sciences, the Russian Academy of Natural Sciences, the British Museum and MIT’s Lincoln Library. The scientists include the best [Hee hee!] in molecular biology, biochemistry, biology, entomology, computational quantum chemistry, microbiology, psychiatry and behavioral sciences, astrophysics, marine biology, cellular biology, physics and astronomy, math, physics, geology and anthropology, according to Evolution News, an online publication of the Discovery Institute in Seattle, which promotes the theory of intelligent design. Did the Discoveroids really say that the people who signed their list are “the best”? We read their article again and didn’t find that claim. Anyway, other than quoting a lot from the Discoveroids’ blog, that’s all WND has to say. The result is that their drooling readership are given the strong impression that the scientific community’s confidence in evolution is collapsing. We’re looking forward to seeing references to this in future letters-to-the-editor. The Curmudgeon says “If you study the Discoveroids’ list you’ll see that an ark-load of those “highly influential” scientists are from bible colleges like Biola and Liberty University. :” I downloaded the list from the link SC provided . I then scanned the list page by page . Although there are bible college “scientists” on the list, many of the universities listed are viable research universities. While this says nothing about the academic prowess of the signers listed, the universities listed are pretty good ones. This does NOT change the possibility that some or many of these signatories have other , shall we say, less secular academic credentials and that the Discoveries listed only secular institutions in order to conceal the religion based nature of their objections to modern scientific theories like evolution, I can’t characterize the group of 1,000 as highly bible college oriented at all. Of course, we are looking at a list compiled by one of the most fraudulent and deceitful bible based science hating group in the world. But, the group overall has many respected institutions listed next to the names of the supposed evolution denier. Did I miss something? Which begs the question. Could Noah have gotten all 1000 of these kooks on the ark without capsizing it? If so, they certainly would have been helpful shoveling manure, something they all have to be considered experts at based on their appearance on the list. Shovels up lads !!! Myself, I don’t like to engage in a personality debate. The issue of interest and of importance is not whether so-and-so is a good guy. It is about the best exposition of the variety of the world of life on Earth. So far, there is no contest, except on details. No one has offered an alternative to evolution. Does the thing that they signed mention the age of life on Earth (less than a million years, for examplle)? Does it mention Noah’s Ark? Does it mention Adam and Eve? I got a little carried away. But there are at least a half-dozen mentions of Biola, and I found one from Liberty. For example, Ann (“Annie Green Screen”) Gauger is there, listed as “Ph.D. Zoology” and “University of Washington” in the other two columns. I’m prepared to believe that Dr. Gauger did indeed get a Ph.D. in Zoology from U.Wash., but we all know that her current affiliation is the DiscoTute. And who would be surprised if all the Discoverrhoids signed the list: it’s a part of their belief system. If the list were more easily searchable, such as being in a table or spreadsheet, it might be fun to go through it; but I have a living to earn. No worries SC. Still my hero. Derek. I agree with you 100%. . There has to be a considerable level of fraud involved if the Tute compiled the list. One can earn a PhD without much reflection – even from a good school. If one is an authoritarian going in, one could still be coming out. Creationists are nothing if not authoritarians – science is just an additional (if lesser than the Bible) authority for supporting one’s beliefs. WND is one of Ken Hams favourite news source, so no surprise they like the IDiots. It’s not just the engineers, physicians, and physicists. Unfortunately, there are biologists, some of whom have done good work, who don’t understand even the rudiments of evolution. And there are those who think they’ve found a fatal flaw. There always will be. But, a list of 1000, even 2000, doubters pales compared to those who find both the fact and theory of evolution convincing. There are flaws in the consensus view of any science. The fact that there are people working in the sciences is because those people think that there are flaws. But no one has proposed an alternative to evolution, something else which can explain the variety of life. In particular, no one has suggested how “intelligent design” can account for some feature of the world of life. What happens in life by way of ID so that something-or-other turns out the way that it does, rather than a different way. Likewise anything supernatural, or something that God does. If someone says that they have a better explanation, let them produce that explanation. Read the terms of the statement they endorse. One can have no doubt of the factual and well-established basis of the theory of evolution, and still be able truthfully to sign it. It would merely be naive. On the point of academic qualification, the list gives only the name of the most credible institution at which the respondent ever worked or studied, in however junior or transient a capacity, not the one at which their views were actually formed. Worse – sometimes there is no consensus at all, like on the interpretation of Quantum Mechanics. Or there is nothing to have a consensus on, like on superconductivity. Still I yet have to meet the first creacrapper who points at such flaws and triumphantly exclaims: “Goddiddid!”. I faintly remember that some people were hoodwinked into signing, misled by the innocuous wording of the statement, and later retracted their vote. Maybe someone remembers who this might have been? Anyone want to sign on to the Dissent from Germ Theory?